Springtime means gardening for many people, myself included. There was a time when every spring meant the planting of a vegetable garden that would entail the use of a tractor with plows, harrows, hillers, seeders and then rakes, hoes and many hours of weeding. It gave us all the vegetables we ever needed and more. On my return to the workforce full time the vegetable garden became a thing of the past. There was no longer time to spend working the soil and keeping the weeds at bay. In time flowers satisfied the gardening itch when I discovered how a perennial bed once well established would need minimal care with maximum reward. I still missed the just-picked taste of a tomato, pepper, or carrot though, so I have been thinking and reading a lot lately about alternative ways of vegetable gardening . I wanted to find some way to have a garden without the intensive ground preparation and maintenance of years before. There are lots of options, from container gardening to raised beds but one method caught my eye – straw bale gardening. I had never heard about it before and came across an article on the internet that explained how one could have a garden without having to prepare any ground at all. In a nutshell, the straw bales are conditioned with water and fertilizer until the inner portion begins to compost. At this point you can make small indentations and plant seedlings or spread a layer of potting soil and plant seeds on top. 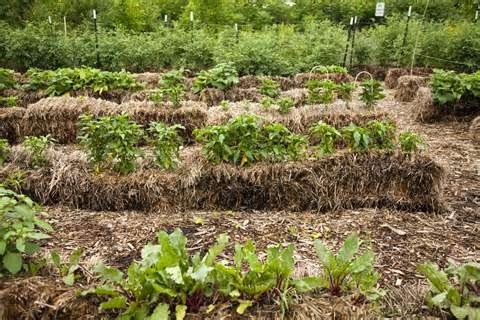 Slowly, over the season, the bale will continue to compost and the plants continue to grown inside with weeding not being needed. 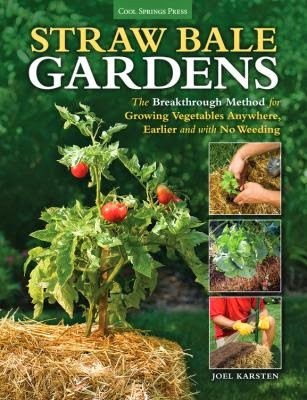 Just type “straw bale gardening” in your browser and several websites come up that explain the concept - for example, this one. The library also had a book on the subject, and after reading that I have decided that this method is worth a try. I have just purchased the bales and look forward to this experiment. Gardening is a hobby that I think makes me a happier person, so hopefully I will be able to report success this fall but even if it doesn’t turn out as advertised I will have had fun playing the growing game. We’ve made some changes. Late in the day on April 21st you’ll see our new library catalogue. It looks a little different, and has some new features. There are some searching tips you’ll see near the top of the screen, these can be very helpful. For example, if you are unsure as to how to spell an author’s name: Jan Pienkowski or Susan Wojciechowski. You can type as little as the first three letters followed by a $ sign (ex. Woj$) and then click on “author” then on “Search”. You will get a list of titles by authors where the first three letters are Woj, examples are Lisa Wojna, Ted Wojasik and of course Susan Wojciechowski. Use the Go Back option with the catalogue to “go back” to the previous screen. You’ll find the catalogue works much better using this feature. The search results of this new catalogue will be more on target with your inquiry and will be pre-sorted. There will be more entries with added content including covers, summaries and reviews. The Advanced Search contains additional options for refining your search. My special mention is the Collection option. 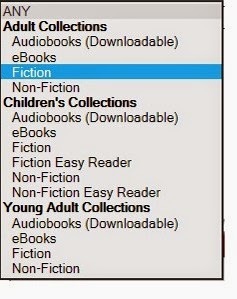 With this you can choose Adult Non-Fiction when doing your subject search for “Egypt”. You won’t get those fiction books about Egypt in your list or children’s books. The possibilities are endless. Now, for the best part-- if you place holds you’ll really like this one. You are now able to add suspension dates to your holds. So, you have too many books to read, or you are going away for a couple of weeks. You don’t really want to have to cancel your holds for those books you’ve been waiting for only to start at the bottom of the list again. You can add the suspension dates to whichever holds you wish so that they do not become available to you during the dates you choose (this was previously only available through staff). Your hold will continue to move up through the list as before, but when your hold is at the top of the list, other users after you will get the book, until the suspension period has passed - then it will be held for you. You’re not the bookmobile, are you? Kurt Haussecker is AVRL’s delivery driver and we couldn’t manage without him. He makes four trips a week to each of our library locations, traversing Highway 101 and the #1 from Annapolis Royal to Windsor. Each day, each way, he transports hundreds of kilograms of books and library materials which make their way into the hands of appreciative library users. He also carries totes full of puppets, laptops, storytime props, and LEGOS. We love this guy (so should you! ), and we wanted to give him a nod on our library blog. - $/!*#%*! – who’s in my parking spot? - March 19th – They started fixing potholes! - March 20th – Lucked into pizza at Wolfville Library who had 5 pizzas donated by a local restaurant.Later, same day, Windsor Library was having their 3rd Thursday jam session with coffee and cookies! - March 28 – Super heavy delivery day after 2 cancelled ones due to storm. Lots of wind damage noted including shingles off roofs. - Additional delivery day added to cope with volume. Will anyone have pizza today? - Few more days of very bad weather. Rivers swollen with spring run-off. Well, that’s just a snapshot – the good, the bad, and the ugly - of Kurt’s 14-year journey with AVRL. If you see him on your travels, give him a wave and please let him know you appreciate him as much as we do. A sure sign of spring is the Daffodil and every April this is the symbol of the national fundraising campaign put on by the Canadian Cancer Society. Society volunteers through numerous activities work to raise funds for the fight against cancer. 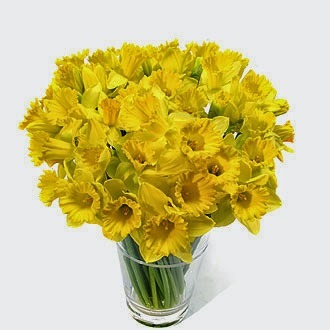 There will be fresh daffodils and daffodil pins for sale via canvassing campaigns throughout the month. There are many reasons for supporting these campaigns with research funding being at the top of the list for most people. According to the Cancer Society statistics over 60% of people diagnosed with cancer will survive compared to 25% in the 1940’s when research first began to be funded by the society. For more information you can download the Canadian Cancer Statistics publication 2013 offered here. Your local library has ebooks, guidebooks, audiobooks, dvds, cookbooks, memoirs and survivor stories to help you learn all you can to prevent, fight and survive cancer. This disease touches everyone so wear the symbol of hope and renewal this April knowing that you are making a difference.